In scientific gobbledygook pyrroloquinoline quinone (PQQ) is defined broadly as a enzyme cofactor and more specifically as a growth factor in plants and animals1. This essentially means PQQ is involved in the activation and expression of cellular factors involved in the regulation of the body’s energy metabolism pathways1. In more relatable terms, PQQ plays a role in remodelling of muscle tissue to a fiber-type composition geared more toward fat burning and less carbohydrate oxidation2,3. As such, the primary interest in PQQ supplementation lies in its application to endurance athletes. Where Does PQQ Come From? PQQ is present in tissue and body fluids of both humans and animals, albeit at very low concentrations (i.e. ng/g range)4. Several studies have also shown that PQQ occurs in at low levels in a wide range of foods2. The table below provides an example of its levels in a range of foods. 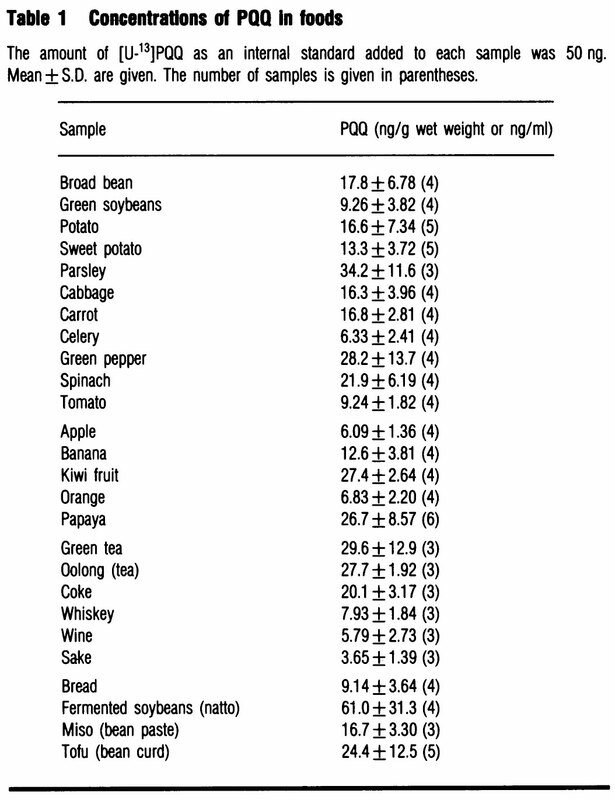 Studies suggest humans consume from 0.1 to 1.0 mg PQQ (and its derivatives) per day from food sources. Much of the research concerning the therapeutic properties of PQQ has been conducted in animals, however and it is not clear yet whether these benefits can be extrapolated to humans. There are however a select number of recent studies in humans, which suggest that some of the benefits seen in animal studies may also transfer to humans. Studies in rats and mice show that when added to nutritionally complete, semi-purified diets devoid of PQQ, as little as 300 ug PQQ per kg diet improves reproduction and enhances neonatal rates of growth compared to diets devoid of PQQ1. The reduced form of PQQ used in supplements has been proven to be a potent antioxidant that is relatively stable and therefore more efficient in its action compared with other endogenous antioxidants1. In one of the few oral supplementation studies in humans with PQQ, it was shown to dramatically reduce the levels of c-reactive protein (CRP); one of the most reliable indicators of inflammation1. Raised inflammation is related to a wide range of chronic diseases and as such, any nutrient or agent that can reduce inflammation is generally beneficial to a range of health outcomes. Studies in animals and humans show PQQ has the potential to improve a process called beta-oxidation, which is the body’s main pathway for generating energy from fat5, 6. This is also the area where PQQ may possibly improve performance in athletes. There is also data in human and animal studies showing supplementation with PQQ may improve nitrogen retention in muscle and therefore have anabolic properties with regard to muscle growth1, 7. There is no formal safety data concerning PQQ in humans, however, given its low level in food and relatively high cost, the possibility of administration/consumption of large doses is thought to be very minimal. What’s more, the results of studies in animal models do not point to any likely adverse side-effects from PQQ consumption in humans. Studies in humans have used between 0.2 – 0.3 mg PQQ/kg bodyweight, which equates to between 14-21mg for an average 70kg individual. While timing of dose is not critical, many recommend to take in the morning for its purported beneficial effects on brain function. At the time of writing, there are very few oral PQQ supplements available. However, of the ones on the market, they typically provide anywhere between 5 – 15mg of PQQ per dose. Some PQQ supplements come in liquid form, which is believed to be superior for absorption, although there is little evidence to substantiate this. PQQ is most commonly stacked with CoQ10; a popular mitochondrial booster and antioxidant. Given its purported benefits for nerve cell function, PQQ may be stacked with other nootropics to complement its action. Harris CB, et al. Dietary pyrroloquinoline quinine (PQQ) alters indicators of inflammation and mitochondrial-related metabolism in human subjects. Journal of Nutritional Biochemistry. 2013;24:2076-2084. Kumazawa T, et al. Levels of pyrroloquinoline quinine in various foods. Biochemistry Journal. 1995;307:331-333. Liang H & Ward WF. PGC-1 alpha: a key regulatory of energy metabolism. Adv Physiol Educ. 2006;30:145-151. Kumazawa T, et al. Failure to verify the presence of pyrroloquinoline quinone (PQQ) in bovine plasma amine oxidase by gas chromatography/mass spectrometry. Arch Biochem Biophys.1990;283(2):533–536. Chowanadisai W, et al. Pyrroloquinoline quinone stimulates mitochondrial biogenesis through cAMP response element-binding protein phosphorylation and increased PGC-1alpha expression. J Biol Chem 2010;285:142–52. Bauerly K, et al. Altering pyrroloquinoline quinone nutritional status modulates mitochondrial, lipid, and energy metabolism in rats. PLoS One 2011;6:e21779. Adhihetty PJ, et al. The role of PGC-1 alpha on mitochondrial function and apoptotic susceptibility in muscle. Am J Physiol Cell Physiol. 2009;297:C217-25.